Franz-Benno Delonge brings the Big City back to life along with all new artwork by Mike Doyle! 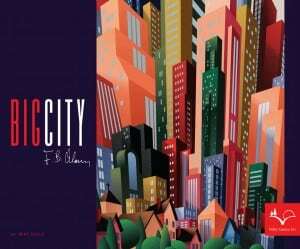 In Big City, players take the role of a competing city planner and builder, each attempting to build a small town into a booming metropolis. But each player will have a different vision for the city’s development, and competition can be fierce! Big City is played in different neighbourhoods, whose position can change each game. Each player is given control of different building sites throughout the city, onto which they can construct buildings of different sizes and point values. To be truly successful, players must attempt to acquire adjacent plots of land, in order to build larger and more valuable buildings. After all, a player’s vision must be more than just a single house on every corner! Build houses, cinemas, postal offices, malls, banks and the newly added highrises and hospitals. Add an LRT line to increase the value of your buildings even more! Big City is for 2 to 4 players and takes from 45 – 75 minutes to play. The new Valley Games edition features two new buildings (hospital and highrise) to challenge each player to build bigger and better. Big City is currently still in pre production, we are working with new sculptors to create the new buildings for this game. Once we have these complete we will then be able to get these sculpts to our new plastic manufacturer and get some molds done. When we get to that stage we will have a more accurate release date.